Have you all recovered from the holidays? Eaten and drank your way through a gazillion pounds of salad and fruit? Good, now you’re ready to get back to real life, and just in time too, your poor body is starving for chocolate (I’m basing this solely on a singular experience, mine, and generalizing because I can’t possibly be alone in this, right?). I compromise with my body, I get to fill my desperate chocolate craving and it gets to stay healthy. ish (the word on the healthy-ness of chocolate is not terribly convincing but it MAKES US HAPPY). It’s time for a little devilish play. This cake recipe is free of all grains (and therefore gluten free, yes I’ve been asked that), free of dairy, free of nuts, it uses coconut sugar and maple syrup to sweeten (except the donut glaze). It does contain eggs, I haven’t been successful (yet) in the grain free vegan category. This cake calls for coconut milk yogurt, see my excellent recipe here and here to make delicious additive-free VEGAN yogurt at home. You will also need tiger nut flour which is a wonderful flour made from a pre-biotic fibre rich teeny tuber, so you’ll want it anyway. The Devil as a donut. I don’t have pretty step-by-step pictures. You’ll be fine. Coat your chosen pan with a baking spray or coconut oil (8-9 inch springform, donut mold, or muffin tin for cupcakes, or use liners). In a small bowl whisk to combine all dry ingredients, pressing out any lumps, set aside. In a medium bowl, or the bowl of a stand mixer, whisk room temperature eggs. If your eggs are cold the coconut oil will not emulsify into the wet batter (you can warm cold eggs by placing them in warm water 30 minutes before cracking them open, changing the water after 15 min). Add remaining wet ingredients and whisk until fully blended and thick, a minute or two. 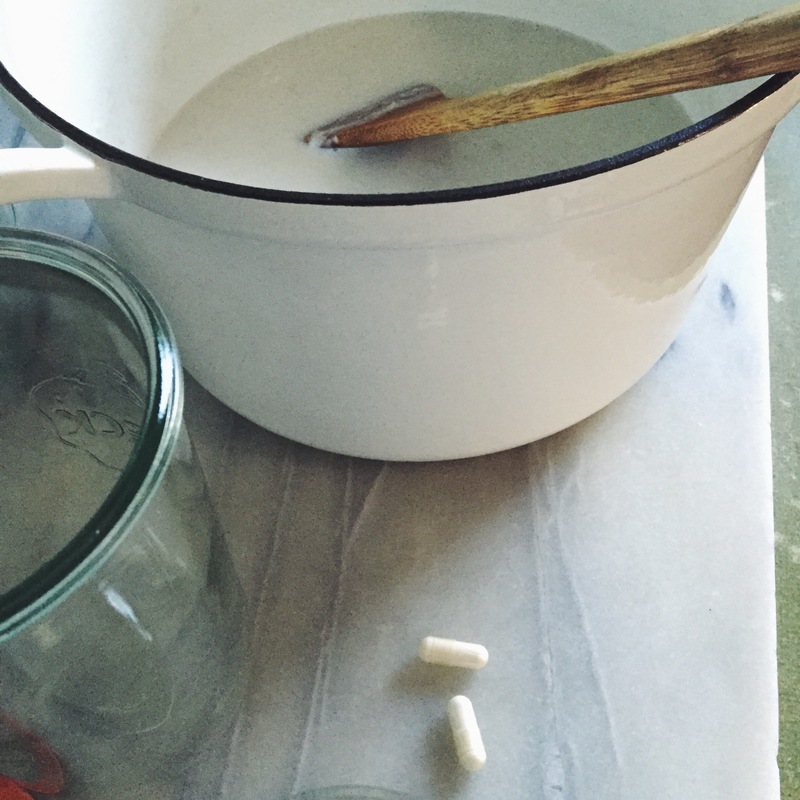 Combine dry and wet ingredients blending until completely incorporated. Pour batter into spring form pan or spoon evenly into donut mold, filling nearly full. Bake cake for 50-60 minutes, bake donuts 20-30 min and bake cupcakes 30-40 min; until a toothpick inserted in the center comes out with crumbs but not wet. Let cool before unmolding. Leave cake whole or, once cooled, slice in two through the center to create a layer. Place chocolate and coconut oil in a heat proof or stainless bowl. Bring coconut milk almost to a boil then pour over chocolate. Stir well to combine, let cool to room temperature then refrigerate. Using a hand mixer or a stand mixer, beat the ganache until thick and fluffy. This ganache will soften at room temperature, so keep it refrgerated until ready to use. Once cake or cupcakes have cooled use a spatula to spread frosting fancifully. Whisk powdered sugar into warmed coconut milk, add crushed raspberries, adjust consistency by adding more powdered sugar a teaspoonful at a time, or adding water a few drops at a time. The glaze should be thick but still pourable. Once donuts are cool enoungh to pop out of their molds, place them on a rack set over parchment paper or a baking sheet. Spoon glaze over each one, letting it drip down the sides a bit ( it shouldn’t be so thin that it runs over the donut). Press freeze dried raspberries onto tops of donuts. Vegan. None of the nasty additives of commercial brands. Easy to make. 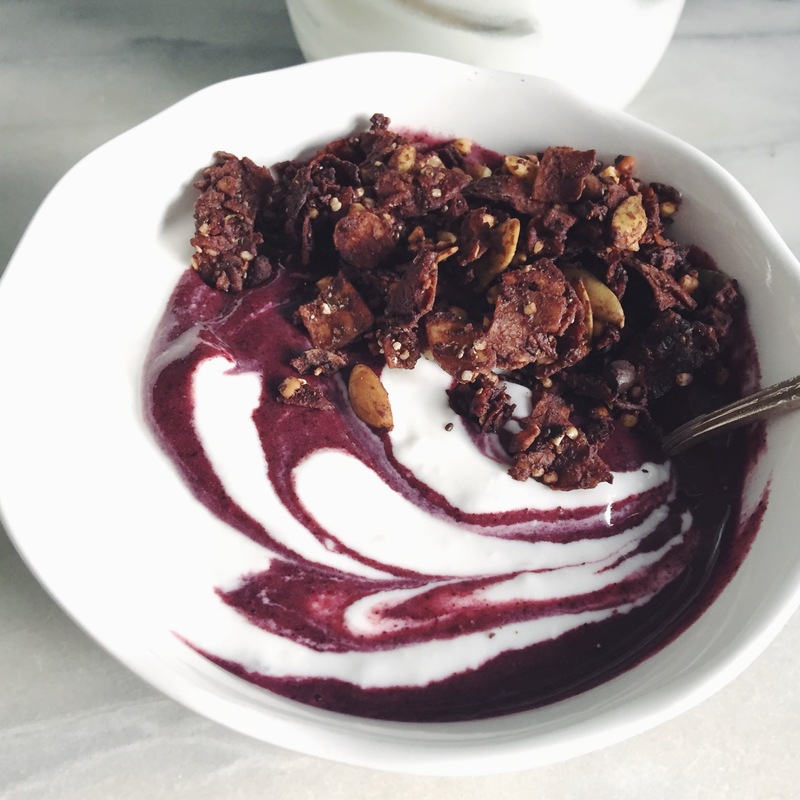 To make this rewarding and fantastic recipe part of your dairy-free pantry, pop on over to Team Yogurt read all about it and a little bit about me. Then take a trip around the gorgeous website full of delectable recipes and writings from some of today’s most influential food writers and food makers. Team Yogurt is the newest beautiful creation by Cheryl Sternman Rule, author of the award winning blog 5 Second Rule and her current book, Yogurt Culture. 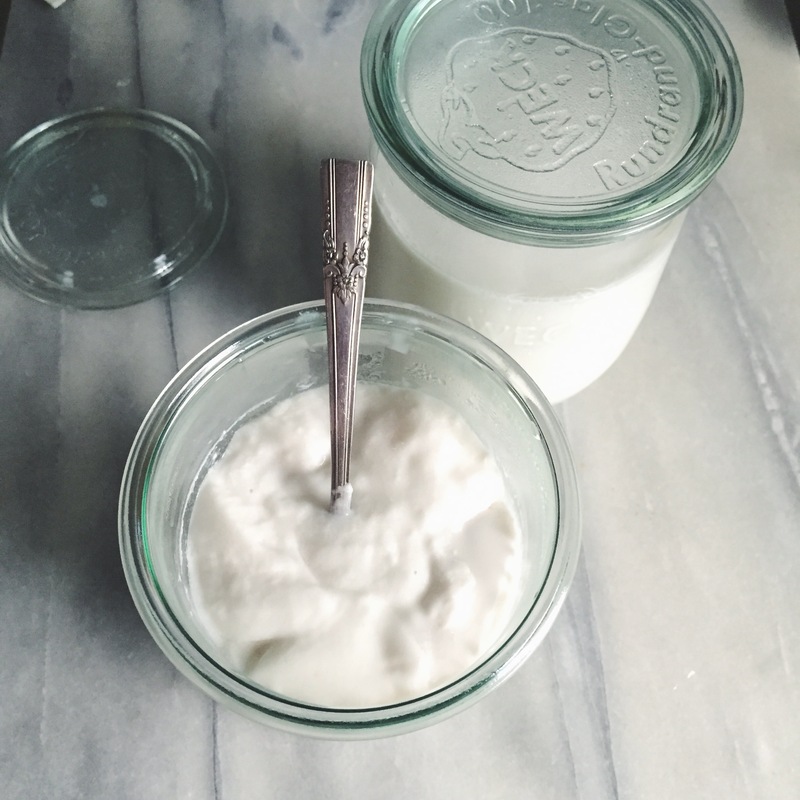 Replace coconut milk yogurt in any recipe calling for dairy yogurt, while it has a different flavor profile, it’s one that is mild and slightly tangy. As always, this recipe has been tested again and again, but glitches happen, please feel free to reach out to me with honest questions. You know those decadent 3 (4 or 5) ingredient peanut butter cookies that have been traversing the internet and cookbooks for several years, the ones that became the mainstay of gluten free offerings in hip neighborhood bakeries everywhere (never mind most of us with Celiac can’t eat peanuts)? I used to bake them as extra large cookie sandwiches; spread with a thick middle layer of decadent chocolate ganache. We couldn’t keep them in the shop, people would phone ahead and reserve. The classic peanut butter and chocolate combination we all (North Americans) seem to crave. 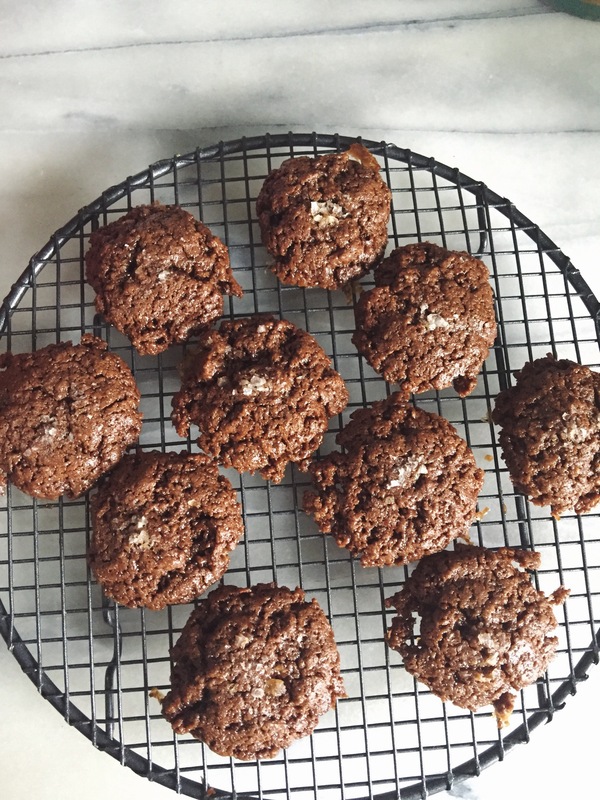 I read about Ovenly’s variation on the recipe in Smitten Kitchen and, really, WHY can’t I have those? (Oh so many reasons, but nuts in general). Smitten Kitchen is powerful magic, puts thoughts in your head buzzing like a fly you can’t get rid of. I needed cookies. And I can eat sunflower seed butter and, oh yes, TAHINI. and while I was at it why not throw in some raw cocoa? And here you go. Not anything at all like chocolate laced halvah, but kind of reminiscent. According to my quick internet search sesame seeds were originally cultivated around 3,500 years ago just for their oil. Tahini is lower in sugar and saturated fat and higher in fiber than peanut butter (and that’s impressive since peanuts are actually a legume) and was introduced to American health food stores in 1940. 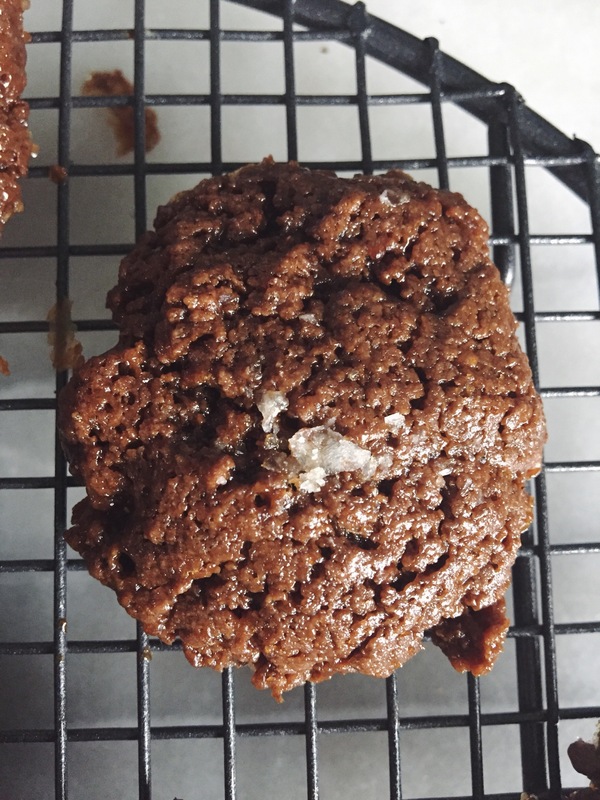 I mention this because I made batches of these cookies with two different tahini, and got vastly differing results. Sometimes there is an abundant oil to solids ratio depending on the brand or even within the same brand, due to this we will never get a tahini as thick as peanut or almond butters, and this can affect our cookies. The tale of fraternal Cookies. Find a tahini that is not too terribly runny, one that stays emulsified for a while after stirring and accept that oil will spread out of these cookies as soon as you begin spooning them on to parchment covered baking sheets (and definitely use parchment). You will be rewarded with tahini and chocolate cookies with a candy-like crunch and supremely gratifying chewiness and may have to hide them. Requires 30 minutes freezing time before baking. Using a stand or hand mixer whip all the ingredients together to thoroughly blend. Do this by hand if you must, make sure it’s all incorporated. Place the dough in your freezer, you may need to transfer it to a smaller bowl. Remove dough, you may see oil beginning to pool, don’t worry. Scoop dough into tablespoon sized rounds, using a measuring spoon or scoop, try to leave the oils behind. Place evenly on baking sheets. Bake 10 minutes then rotate sheets (bottom to top racks and front to back). Bake an additional 6-8 minutes. They may spread, sort of like lace cookies, there may be pools of oil, ignore it. Remove and let cool completely before eating. Okay, eat one, but it will fall apart. 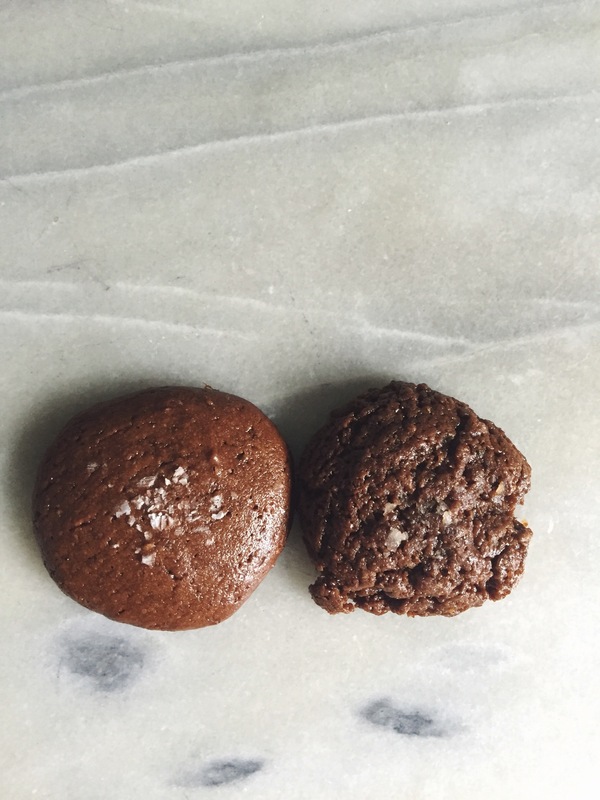 Chewy Decadence paleo and celiac safe. Make sure the tahini is thoroughly stirred before measuring out 1-1/2 cups; the thinner the tahini the oozier the cooky. Using regular or brown sugar will change the overall texture, not bad, just different. Sure, try regular cocoa powder. I just use raw. 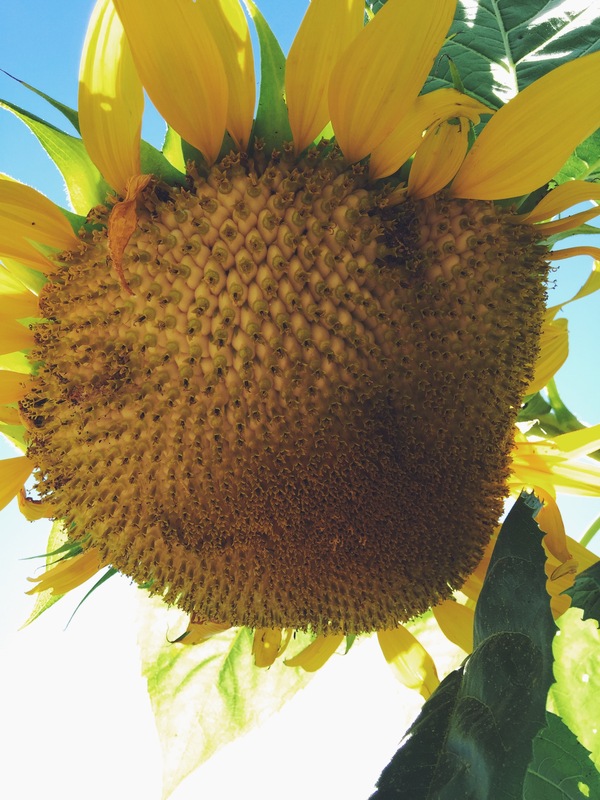 I grew some glorious sunflowers this year, breathtaking in height and sunny color. I harvested 8 (before the birds did!) and laid them on a floor to dry. Small caterpillars came crawling out, those rascals who thought they’d eat their way through until winter. Recently I went to the Common Ground Fair in Maine, a mind boggling haven for agriculture and locally crafted foods and arts. There I saw a demonstration on saving sunflower seeds, how to make a simple frame with wire fencing to scrape the sunflower heads on and pop out the seeds. Some are black oil seeds, true black color with tiny bits of seed meat in the hulls, best for small animal food, but the rest, like this beauty above, are for us. I’m hoping it’s not more work than they’re worth. But let’s get to the apples. Which, truly, I have been craving ever since the end of August when we drove through 3 New England states practically bursting with glorious apple trees. I wanted to stop at every one and grab them off the side of the road (I couldn’t, I wasn’t the one driving). 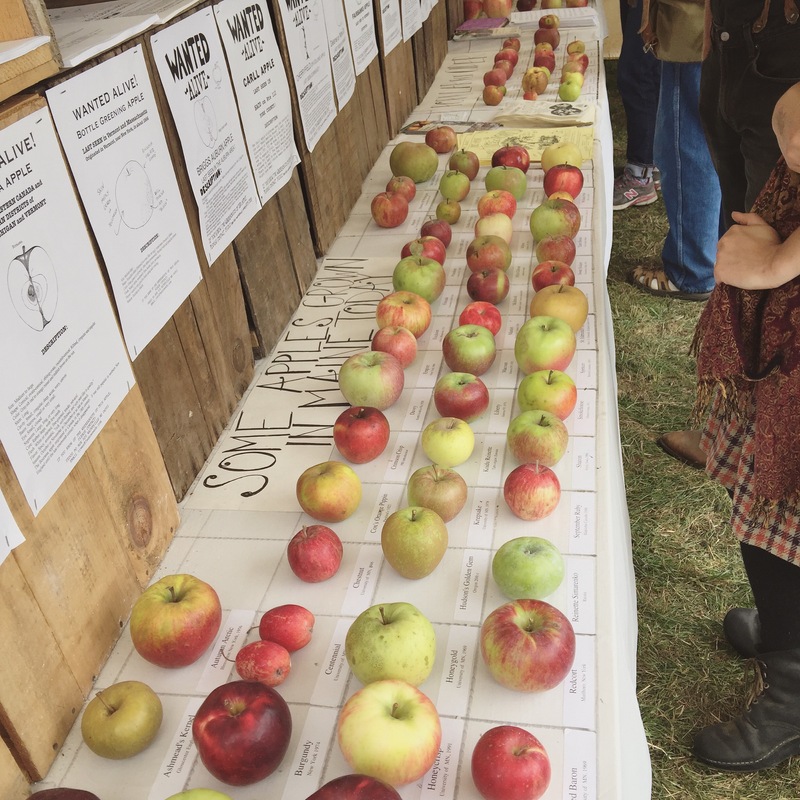 Fedco Trees had an impressive display of heirloom apples, some so rare they have “wanted, alive” signs. I came home with crabapples picked in New Hampshire off trees in front of our inn, heirloom apples from my daughter’s in Maine. I harvested concord grapes then made crabapple & grape jelly (HELL YES, and I’d like to make a case for it being Paleo, since both those fruits are kind of miserable to eat on their own don’t you think our ancestors would have mixed them? With a little honey?) Then used the crabapple pulp with fresh apples to make apple sauce. The thing with abundance is it must be used fast or it becomes waste. Which brings us to this recipe, because now I have applesauce to last all winter and we really don’t eat it. Baking with applesauce, or any fruit or squash mash, is truly a brilliant thing to do. The fruit adds moisture, replaces fat, adds flavor and is sweet on it’s own, which means you can cut down on the sweetener in a recipe, if you want. 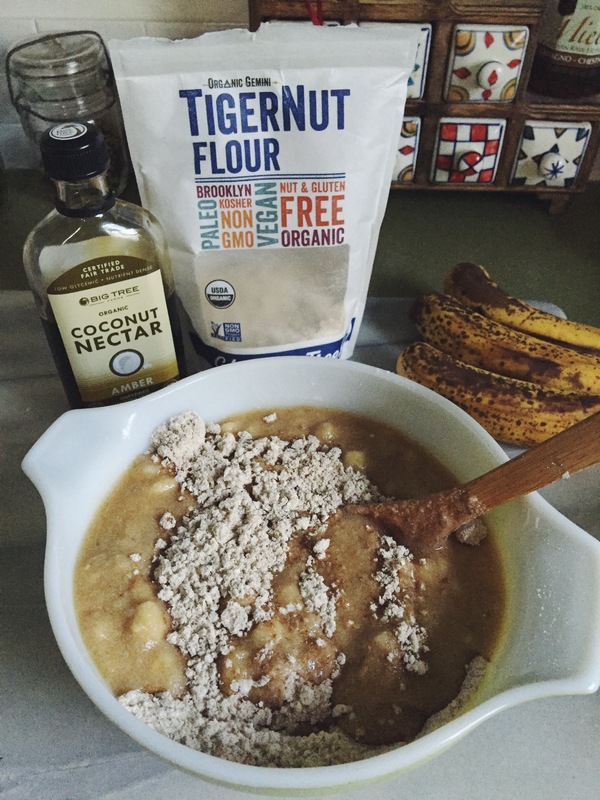 Tiger Nut flour is something completely new to me. A tiny tuber that is dried and ground, much like Cassava (not tapioca), or a nut flour. It’s an excellent source of prebiotic resistant starch, it’s resists digestion and lands in our gut where it attracts probiotic bacteria (the good guys). Apparently our Paleo ancestors where hip to good gut flora, as the claim goes Tiger Nuts were in use about 2 million years ago. (Back when they learned to mash crabapples and concord grapes together with stone kitchen tools). I’ve had great experiences using this flour, my sensitive gut responds happily (maybe owning to the prebiotic nature of it). I’ve had trouble with cassava and tapioca both, I avoid nuts flours and coconut flour, so it’s a game changer to find this. 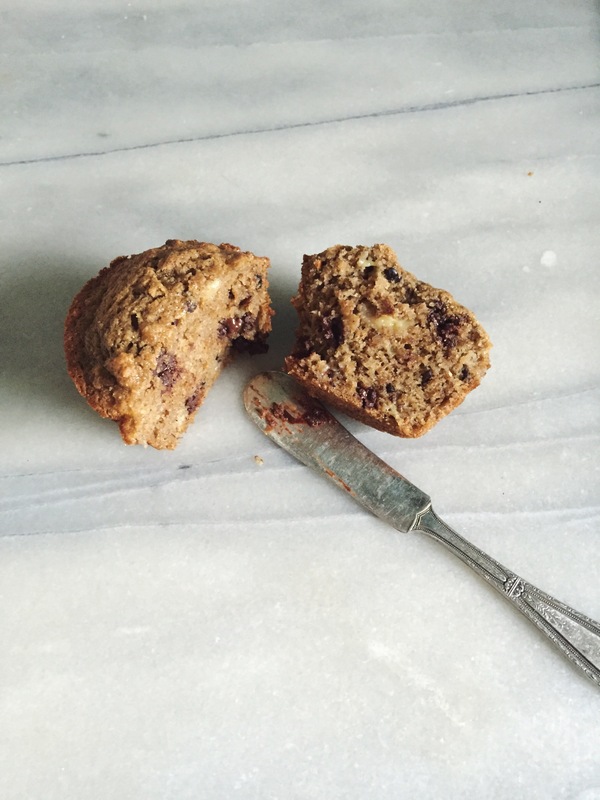 Though a teeny bit gritty, I find the flavor to be pleasant, sweet and melds well with all the baking I’ve tried. Definitely give it a try. Hibernating warm and cozy with baked goods all winter truly appeals. (Leave me recipe ideas to develop in comments!). I used Organic Gemini TigerNut Flour, found at my local health food store. 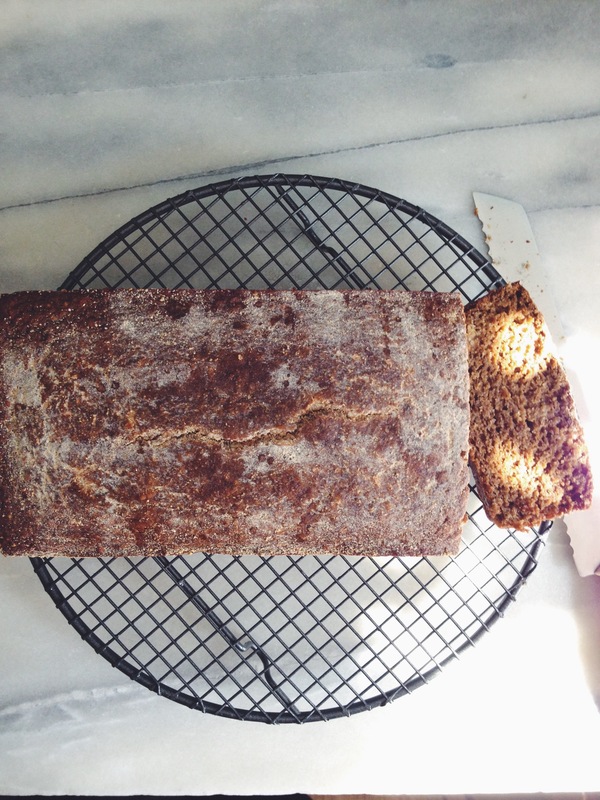 (I give the recipe for the Banana Bread version below). Whisk wet ingredients together well. Pour wet into dry and stir thoroughly to mix. Scoop it all into the prepared loaf pan and bake for 45-55 minutes, until edges pull slightly away from sides and a toothpick comes out of the center clean. Let cool before slicing in, the loaf will release from the pan easier. Replace applesauce with mashed banana and molasses with coconut nectar or honey. Omit nutmeg and cloves, use extra cinnamon in their place if you’d like. 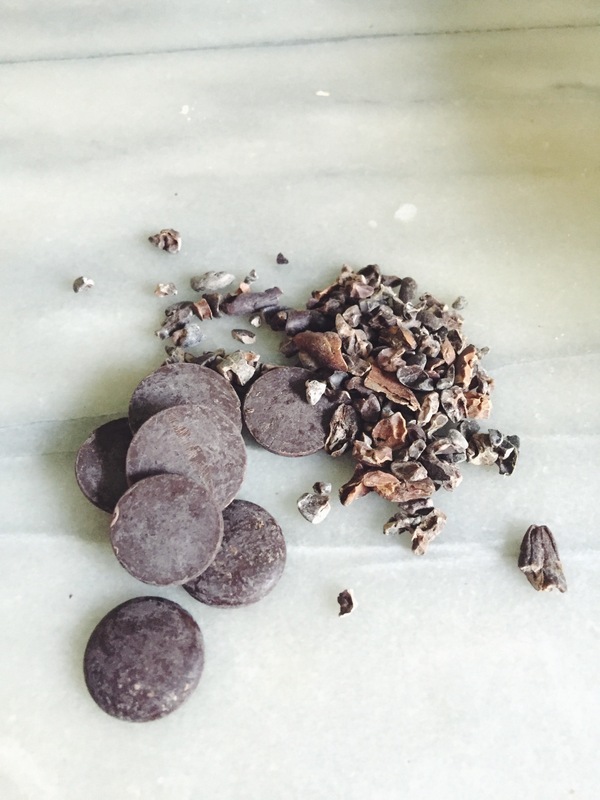 For supreme deliciousness add 1/2 cup chocolate chunks and 1/4 cup raw cocoa nibs. Definitely not Paleo.